Those who are graduating in 2020. ”Contributing to Society through Pearls "
Our company produces pearls, process domestic and overseas wholesale, retail sales of jewelry and jewelry products. The pearl industry is an industry centered on Japan, and its technology and quality are worldwide recognized. You don't have to know anything about pearls at the beginning. Through our thorough training, you will have a good sense of pearls and become a pearl professional. Why don't join us and expand our pearls, which is Japan's pride, to all over the world? Every year, we exhibit at the jewelry show held in Hong Kong every year. At that show, our four foreign employees are working as our front lines, utilize their language advantage and negotiate with Chinese business clients. We hope that new foreign employees will also utilize their language ability to negotiate with business clients at the jewelry show. ・ Who got used to different cultures and customs while doing business with other countries around the world. English and Chinese are preferable but not required. 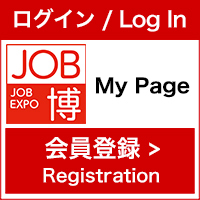 In order to apply for our company, attending company presentation is required. I am lucky to have a chance to work at a company where I can feel at home with many kind seniors, so I am now. Why don't you work with us where you will be surrounded by pearls called "moon's eagle"?